Stamped concrete is becoming a trend for both indoor and outdoor surfaces nowadays because of its expensive looking aesthetics at a more affordable cost. However, there are homeowners who are still quite hesitant about it because of some myths that they have come to believe is true. Before completely rejecting this economical decorative concrete application, let’s straighten out the facts, shall we? Here are some of the most common beliefs about stamped concrete and why you should not believe them. As long as you hire a professional and experienced installer, concrete stamping will have a realistic resemblance to the material it is being substituted for, from pattern to color. However, if you try to do it yourself, or hire a know-it-all newbie, then your floor would definitely look fake. Only a smooth surface will be slippery when wet. Stamped concrete, on the other hand, involve patterns that provide texture to the surface for good traction. Some even apply a sealer mixed with grit to make the surface a lot more slip-resistant. If applied correctly, the concrete overlay is almost as durable as a new concrete slab. Unless you scratch the surface with a really sharp object, the surface will remain intact. Any concrete floor is prone to cracks especially if there is strong movement or displacement underneath it. Stamped concrete installers know this for a fact which is why they incorporate expansion joints or scorelines into the patterns to give the concrete some room to move and expand. This way, new cracks can be prevented. Concrete is one of the most durable materials for construction. Before an overlay is applied, a pro installer would prepare the old concrete underneath to rid it from any dirt, grime, minor cracks, pits, and the likes. This makes it easier to apply the overlay and makes the two layers more adherent to one another, thus, strengthening the floor. It can last a lifetime if well taken care of. Although deicing salts are a big no-no on stamped concrete, this doesn’t mean that it could weaken the actual overlay. Such salts can damage the protective sealer, not the overlay itself. This means the floor will retain its pattern and strength, but the shine of the sealer will fade. These are just some of the most common myths that affect stamped concrete decisions anywhere. Some may be from a misunderstanding and some may have been results of a traumatic stamped concrete experience. 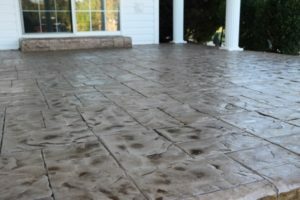 No matter what you hear about this certain decorative concrete application, it is highly recommended for homeowners to talk with a professional stamped concrete contractor first to clarify all doubts. This way, they would get the right information which will ultimately lead to a more sound decision for floor resurfacing projects.